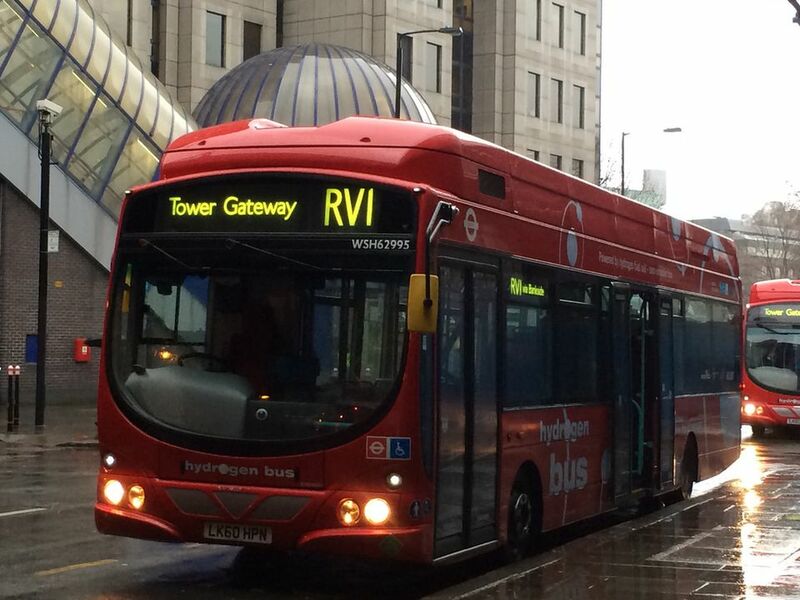 London's RV1 bus route connects many of London's top sights so it's well worth knowing about. RV stands for River because it follows the line of the Thames for a lot of the route. The RV1 is also a clean machine as it's powered by hydrogen fuel cells so only releases water and no smelly fumes. The route links the Tower of London to London Bridge and Borough Market, via Tower Bridge, and Waterloo and the South Bank to Covent Garden. The route starts from opposite Tower Gateway station (the DLR station) and is well signposted from Tower Hill tube station. Don't cross the road to Tower Gateway station; instead, turn left and the bus route starts from under the bridge. An Oyster card or a one-day travelcard makes all buses (and tubes and London trains) a hop on/hop off service (you can jump on and off at different stops throughout the day without paying any extra). While waiting at the bus stop look out for the old wooden Tower Hill station sign on the wall (under the bridge on the same side as the bus stop). The bus goes around the block and then within minutes you're waiting in line to go over Tower Bridge with the Tower of London ahead and to your right. As you go over Tower Bridge, look out on the right-hand side for the disguised chimney before you go over the world famous bridge. As you cross the bridge, look to your right to see City Hall, HMS Belfast and The Shard. Once over the iconic bridge it's right onto Tooley Street. You will pass the Unicorn Theatre on the right which puts on performances for children and young people, then More London, a development of modern buildings that includes City Hall. Next on the right is Hay's Galleria which is built on the site of the 1861 great fire of Tooley Street which was London's biggest fire since the Great Fire of London in 1666. There's a plaque on Battle Bridge Lane, a turning off Tooley Street on the right. London Bridge station is then on your left and as the bus reaches the end of the street look right to see over London Bridge and try to spot the gold top of The Monument, on the other side of the bridge, on the right. The bus turns left here around 10 minutes into your journey, and passes Borough Market on your right before the next stop at The Hop Exchange. This interesting Grade II listed building is on your right at the bus stop. It was a center for the brewing industry when it opened in 1868 and it's now a corporate hospitality venue but it has been well restored. As you pass under a railway bridge over Southwark Street, you can see coloured lights on the wall. The lighting was installed in 2008 as part of a local government project to improve the area, and if you pass by on the half hour or on the hour you'll see the lights slowly changing from a shower of multicolour to a wall of solid colour. While there aren't so many big sights along this route, it does connect many major tourist attractions and the bus announcements even guide you as to where to get off such as "Great Guildford Street. Alight here for The Globe Theatre." And "Lavington Street. Alight here for Tate Modern." More 'under bridge artwork' can be seen near the end of the street with a stripy wall nearly 50 meters long called 'Poured Lines'. You'll be about 20 minutes into the journey at this point. The bus turns into the Coin Street residential area which has managed to create decent housing on what was a near derelict site. The residents got together in the early 1980s to campaign against the proposals for the area which would have destroyed their community and now they live right in the heart of London's thriving South Bank. The bus goes along Upper Ground and Belvedere Road which is parallel to the River Thames, although you can't see it. You'll pass the back of the National Theatre, BFI Southbank, Southbank Centre and Royal Festival Hall before you see the London Eye, also on your right. Look over as you come out from under the bridge, just after the Royal Festival Hall, and you'll see Big Ben too, behind the London Eye. The bus turns left to go to Waterloo Station at about 30 minutes into your journey. As you leave the Waterloo Station/York Road bus stop look to your right to see the decorative Waterloo train station building. And now it's time to go left and over Waterloo Bridge. The views are considered to be some of the best in London as on your left is the South Bank, the Houses of Parliament and the London Eye and on the right you can see St Paul's Cathedral and the City of London. Once over Waterloo Bridge, the bus turns left off the main road and takes you into Covent Garden and the West End. The end of the route leaves you facing the Piazza and ready to explore Covent Garden.